I did sleep well past six for once. I had turned my alarm off. I only started making breakfast after seven. So, rather lazy morning. My husband showed up a little later than usual as well and the boy was really late. Apparently, he had slept until ten. I suggested that he’d tell us the next time and we were a little angry at him showing up so late for breakfast on weekends. The agreement was that he’d come down for breakfast at 9.30 and he usually shows an hour later with no sense of inconveniencing us or anything. So there were dishes and conversations all around and then I tried booking some things for the MENSA annual gathering in April. Yeah, that was funny. There were several hours where the server was completely down, so that occupied me most of the day. Fun will be had again next week for the second round. 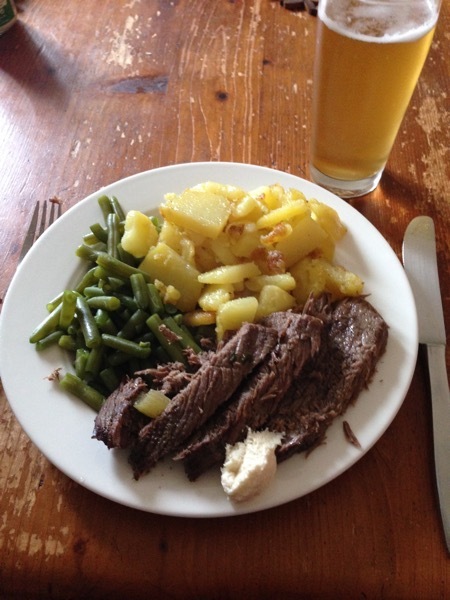 Prime boiled beef, roasted potatoes and green beans with horseradish (Tafelspitz, Rösterdäpfel, Fisolen und Kren in Austrian). That was a really satisfyingly good meal. And there is broth left over that we can use today or so. The boy started a discussion about the loudspeakers he wants to buy from his Christmas and birthday money which led to us all traipsing around the house looking at various speakers and stereo amps that we have sitting around, then upstairs to his room to look at how much room there is and then back down. We made plans of moving things around the house but ultimately decided that it would be the best if he actually did buy something new. So I went upstairs with the boy again and we spent some time looking at various speakers in his price range and at his computer setup to find out how this would all work. That took about an hour-and-a-half. Then we started on graphic tablets. He is drawing much more at the moment and I think something not too pricy would be a good idea for him. Then I spent some more time wrestling with the booking website and I finally prevailed. 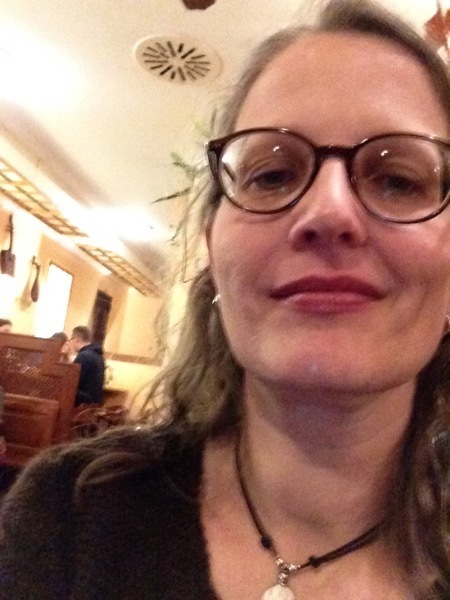 Then it was late enough that I was about to give up on the day but I did try to phone my mother because I want to talk to her about the boy and me maybe visiting my parents after Pentecost. She wasn’t home so I did my yoga, got interrupted by the boy, and after finishing yoga I found that my mother had called me back. We talked very shortly because it was time for the boy and I to watch Star Trek. But my mother will ask her neighbor if we can have his vacation apartment when we visit. Meanwhile the boy had gotten talking with my husband and they had started to examine different kinds of audio cables and jacks because the boy didn’t quite understand what he’d need for his speakers and I had forgotten to tell the boy that I had already talked about this with my husband. Well, and if you have a son with a big interest in physics and technics and a husband with a big interest in music and technics it might happen that jacks get taken apart and there might happen to go a piece missing. The boy and I finally watched an episode of Star Trek Voyager and then realized that it was becoming too late to watch anything else. I got ready for bed, the boy took a shower, I started playing a game on my iPad instead of doing something productive, suddenly it was very late and I got ready for bed. Today there will be running and teaching and I have a long, long list of things I want to do and there will be a potential new student to meet. I’m seeing another full week ahead, though not one with many appointments. Which is rather good.